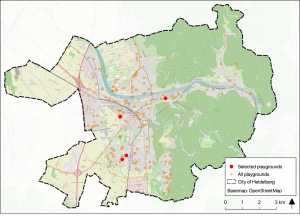 This query reduces the number of potential playgrounds within the city of Heidelberg from 171 to 4 as shown in the map below.Similar questions like this are also addressed within the mFund meinGrün project, which aims at extracting information about urban green spaces and the facilities and activities they provide using diverse data sources such as OSM, Social Media and satellite imagery helping citizens to find the most suitable green space for their needs, e.g. through green and healthy routing in Openrouteservice. But this is by far not the only case where OSHDB spatial queries are useful. They are also a valuable tool when it comes to measuring data quality of OpenStreetMap. The completeness of building addresses for instance is an important quality measure for the applicability of routing services in a certain area. Building addresses in OSM are tagged with the key “addr:housenumber” which can be set in two different ways: as an additional tag of a “building” feature or as a node located within a “building” feature. For the latter case, the number of buildings containing the tag “addr:housenumber” as a node can be queried using the new method contains(). By extending this OSHDB query by a few more lines of code we can take into account both tagging schemes to derive the total percentage of buildings containing information about the house number. 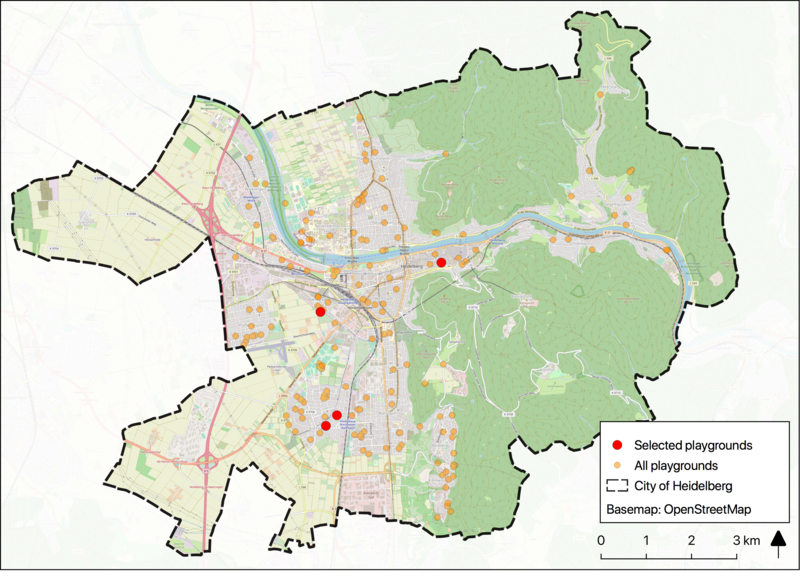 Applying this query to the city of Heidelberg yields the map below. Further quality measures like this are being developed within the DFG Project A framework for measuring the fitness for purpose of OpenStreetMap data based on intrinsic quality indicators and HeiGIT. The spatial join functionality of the OSHDB is still at the development stage. If you want to stay up to date, check out our OSHDB GitHub repository. Stay tuned for further ohsome news!